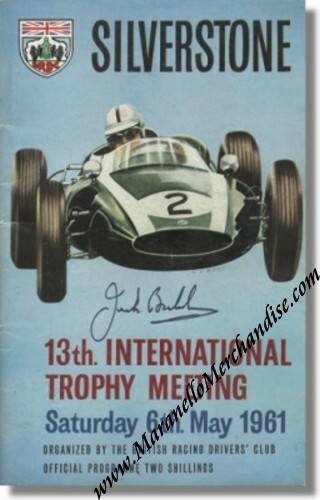 Sir Jack Brabham signed 1961 International Trophy Program booklet. Here we have a vintage 1961 programme booklet for the International Trophy, held at Silverstone race track. 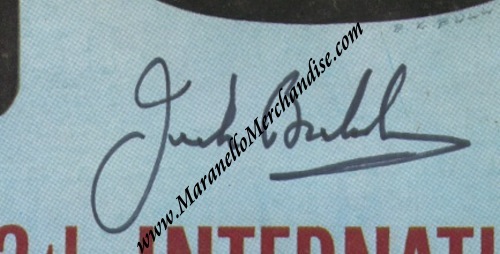 The cover has been signed by triple F1 World Champion, Sir Jack Brabham. The 1961 International Trophy was a Formula 2 race but all great names in F1 took part in it. The race was won by Stirling Moss in a Copper T53P Climax, followed by Sir Jack Brabham also in a T53 Climax and Roy Salvadori ALSO in a T53 Climax.